The EPL-PM-100LED-UVA-150-EPP from Larson Electronics is an Explosion Proof Ultraviolet Portable Light Fixture that provides operators with a powerful and energy efficient alternative to traditional hazardous location luminaries with UV cutoff filters. LED technology and compact design makes this lamp an excellent replacement upgrade option for bulky and high maintenance cost older incandescent, metal halide and high pressure sodium lights. This portable UV light fixture is mounted to an A-frame style aluminum base and has an adjustable light head measuring 16 inches wide by 14 inches high. 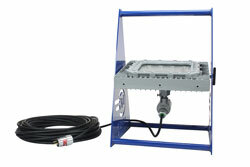 This fixture uses advanced LED light technology to produce ultraviolet light and is T6 rated for hazardous locations where UV lamps are used in paint and adhesive curing, food inspection or for non-destructive testing. This Class I Divisions 1 & 2, Class II Divisions 1 & 2 explosion proof UV light fixture provides 46,550 mW of high quality ultraviolet light while drawing only 150 watts. This portable LED light is mounted to an A-frame style aluminum base and has an adjustable LED light head measuring 16 inches wide by 14 inches high. This high output UV LED fixture provides a 6,384 µW/cm2 center beam maximum intensity at 12" while providing a minimum 2,660 µW/cm2 intensity over a 14" by 14" area. The EPL-PM-100LED-UVA-150-EPP is typically used for curing coatings or adhesives and for non-destructive testing applications. This fixture has been thoroughly tested with the DuPont line of ultraviolet curable paint and primers, accelerating the cure times over metal halide fixtures with surface temperatures as low at 55°F. The EPL-PM-100LED-UVA-150-EPP uses ultraviolet LED light technology, a technology that is far better in energy saving than traditional fluorescent bulbs used for the same purposes. Traditional ultraviolet lights require a coating to block out visible light or a special composition of gases and chemicals used to create a higher concentration of ultraviolet light. This process, however, also produces many other wavelengths of light which go unused and end up as wasted energy. LED lights are unique in that they have a narrower wavelength band than traditional ultraviolet sources and therefore do not require these special coatings. As a result, LED lights do not produce unused, wasted light and therefore consume less energy than traditional UV lights on the market. LED lights have the added benefit of being capable of producing very specific wavelengths with tighter curves and are more durable and light weight as well. This eliminates harmful UV-B and UV-C wavelengths from being emitted from the light source, adding in productivity and safety during operation. The Class I & II, Divisions 1 & 2 LED ultraviolet light fixture can be used for non-destructive testing in aviation and manufacturing, food processing and inspection, and in paint, coating, and adhesive curing. 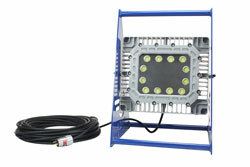 The EPL-PM-100LED-UVA-150-EPP provides operators in hazardous locations with a reliable and durable UV lighting solution that combines effective production of UV light with explosion proof protection and is applicable for leak detection, paint spray booths, ink, coatings, and adhesive curing, non-destructive testing, inspection, and food processing. 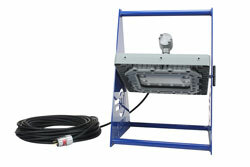 This LED UV light produces 35,000 mW with a wavelength curve of 350-380NM.